Once again military courts are all the rage. Yes, there was a ‘sunset clause’ when the APS tragedy forced the 21st amendment two years ago. And, sure, for a while things were quiet enough as we went about breaking the enemy’s back and trumpeting about it all the time. But this new wave of violence has ruled out the expiry clause in the military courts, and while the government and opposition haggle over the fine print of the extension, lives continue to be wasted. So, as the fighting worsens yet again, have the military courts been worth it? Does their extension owe to their own performance or the situation worsening geometrically? Will we come back to square one yet again in another couple of years down the line? 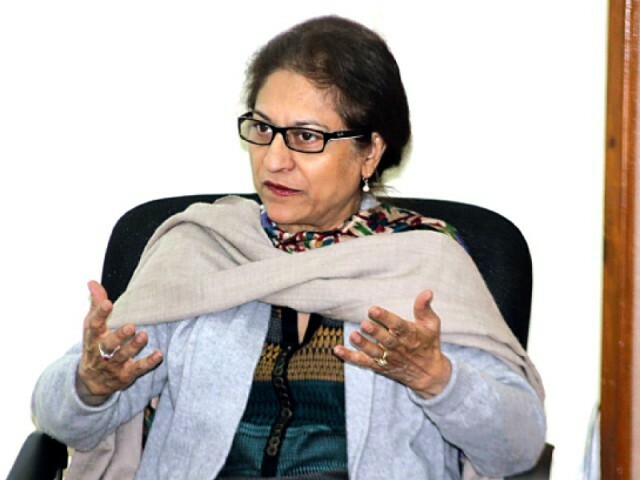 To make sense of this fast evolving situation, this scribe talked exclusively to prominent lawyer, legal expert and human rights activist Asma Jahangir. Question: How does one judge the success, or otherwise, of an initiative like military courts in our particular present setting? Do you feel the last two years of military courts have been successful? Asma Jahangir (AJ): Well, the last two years’ experience has been very poor. First of all a large number of people who have been convicted by the military courts were already in military custody in the internment centres in Swat. Then to get their confession after four years and convict them is a sheer travesty of justice. There were no lawyers at the trial, the accused were not even shown their records and the entire judgment was cut and paste for everyone. The whole practice was very stereotypical. So if you have to go through the motions of having a military court when everyone knows this is just for their own sake, you may as well allow them to choose whom they want to punish and whom they don’t want to punish. Secondly, they have not done great wonders in a number of cases they have attended to, despite the fact that they’ve hardly sat over these cases in a proper trial, they mostly handed down convictions over confessions. The last thing is they don’t allow an accused to be represented through a lawyer, although it is in their Army Act and they even violated their Army Act. They did not allow it. Now the Supreme Court has said that it is the right of the accused to be represented by a lawyer and so in all trials people will be more aware and will take lawyers with them. That means that these trials will linger on as lawyers will ask for due process. There will be a lot of tension between practising lawyers and the Judge Advocate General (JAG) department, since they are not practising lawyers, they are self-made, self-professed lawyers. So I don’t see it all working out well. At present, the government is taking very bold decisions like reforms on the Federally Administered Tribal Areas (FATA). But much more needs to be done. Until and unless the government does not give up on nepotism, things are not going to improve. No institution in this country is perfect, neither is the military for that matter. Q. What, really, is the significance of the ‘sunset clause’ if the expiry date is simply not going to be honoured? AJ: If you remember, the judgment that was given by the Supreme Court, which was a majority judgment, was authored by Justice Azmat Saeed Sheikh and he said that one of the reasons that justified the amendment of the Constitution to establish military courts was the sunset clause. Now the sunset clause is gone. The extension of military courts will be challenged again in the Supreme Court. For better sense to prevail, give ordinary courts another name and give full protection to the judges of those courts. The government is the person that selects which case goes to the military courts and which doesn’t. There are no criteria. On what criteria has the government sent these cases? We don’t know. There is no transparency either. Q: Since the operation is going to last “till the last terrorist is killed”, why not leave the military court option open-ended as well, till the war is won? AJ: The question I ask is, have military courts ended terrorism anywhere in the world? Give me a single example. Why are they fooling people then? They rather give birth to a reaction since you are not giving people due process and there are more chances that you are doing injustice. If you do injustice, you better prepare for the reprisals. Doing justice is not an easy job, it is not the work of a soldier. It seems that we’ll keep renewing the ‘sunset clause’, as they say that military courts will stay till the criminal justice system is revived, meaning thereby that a worse system will replace a bad one. If terrorism is a problem in this country, so is corruption. So why not also extend the powers of military courts to hear corruption cases as well? Let’s see if parliamentarians agree to that. Q: Weren’t military courts resorted to precisely because the conventional justice delivery system had collapsed? As such, there were expectations of deep-rooted judicial reforms so that military courts would not be needed in future. Why do you think no reforms have taken place despite the urgency? AJ: Bringing reforms is a gradual process and they are brought all the time. However, they didn’t come at a pace with which they should’ve been made. Still, it is not a collapsed system even though it is not a strong system either. If it is a collapsed system that can’t give you justice, then you should get rid of it. But why do these politicians who say such things go to very same courts to seek justice? They should also take Panamagate to military courts. Who punished Mumtaz Qadri? Who punished Umer Sheikh? These conventional courts did. Let us not say that courts of the land don’t give punishments. When terrorists are being supported by the agencies of the state, that is when the other institutions become helpless. So if agents of the state stop protecting these terrorists, institutions will carry out their accountability. At present, the government is taking very bold decisions like reforms on FATA. But much more needs to be done. Unless and until the government does not give up on nepotism, things are not going to improve. No institution in this country is perfect, neither is the military for that matter. Q: Please quantify exactly what it would take to get the judiciary performing up to its high standards again? As of now, it is known for backlog going into decades, corruption, outside influence, etc, and not much by way of dispensing justice. Do you feel the criticism coming the judiciary’s way is justified? AJ: Firstly, you have to be absolutely sure about how you appoint judges. It has to be done on merit. For example, many people have fought with me because I am against the quota system in judiciary, because I think these judges decide people’s fate and lives. Each one decides on his or her own, it’s not like they decide collectively or in a group. Unfortunately, we are not looking. Also, the human resource has to be of a better quality. Secondly, it’s not that the judiciary can reform itself, laws also need to be changed. There is overlapping of various laws and our Criminal Procedural Code is very old so we need an overall revamping of our laws. A lot of work has been done by committees set up by the Prime Minister. But none of those suggestions and recommendations have been implemented. Once you have the legislation, then you have to train the subordinate judiciary. District judiciary has to be trained as well. We just put them on the job and leave them there to learn for themselves. We now have judicial academies but we need to run them in a proper and more professional way. Furthermore, litigants ultimately knock the doors of the High Courts and Supreme Court and even today the High Courts and Supreme Court have credibility. However, in my personal opinion, the criticism on the judiciary, for the large part, is indeed justified and steps are direly needed to overhaul the entire judicial system. Previously published in Pakistan Today and republished here with permission. The writer is a law graduate and currently works as an investigative journalist and columnist at Pakistan Today, Islamabad Bureau.